The SensIQ is a motion detector for walls and ceilings which are fast becoming accepted as one of the most cleverly thought-through motion detectors of its type. It not only looks good but offers a high level of intelligence. The SensIQ incorporates several unique features including being the first sensor for all requirements and coverage angles from 200 deg to 300 deg. A remote control makes handling exceptionally easy. Its detection reach can be easily adjusted in three different directions on the unit itself both quickly and accurately saving you the time that used to be required to carry out these adjustments. The SensIQ has been awarded an internationally coveted IF Design Award for its combination of professional sensor technology and contemporary design. Accessories for the SensIQ models leave no question unanswered. Soft Start module, Wireless Module or floating module can adapt the SensIQ to your specific requirements and the remote control make operation exceptionally simple. The twilight setting, the time setting and the reach setting are three important parameters that can be easily adjusted directly in the unit. 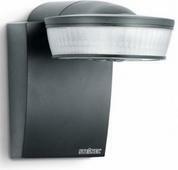 For the twilight setting the sensor’s response threshold can be set to values of between 2 lux and 2000 lux. The time you want the connected load to stay ‘ON’ at night can be infinitely varied from five seconds to fifteen minutes. A pulse function is also provided. The reach can be adjusted in three directions by three separate control dials (100 deg. Respectively) independently from one another. Twilight Setting (response threshold) The response threshold can be set to between 2 and 2000 lux. You can save the twilight response threshold using the remote control. Reach Setting: Three control dials set to reach in three directions (100 deg each) to the accuracy of a metre.The time you want the light to stay ‘ON’ for can be infinitely varied between 5 seconds and 15 minutes. Pulse Mode: In the pulse mode, the output is activated for 2 seconds (e.g. for staircase lighting time switches). Afterwards, the sensor does not react to a movement for approx. 8 sec. The SensIQ provides a number of special functions. One of them is the holiday mode. This is activated by the relevant button on the IR remote control. The holiday function simulates occupancy to protect your home from intruders while you are away. When the twilight threshold is reached the connected load is switched ‘On and ‘OFF’ at certain programmed times. Normal sensor mode remains active. This function can also be selected using the remote control supplied with the sensor. Pressing the relevant button switches the connected load ‘ON’ for four hours. After this period the sensor returns to sensor mode automatically. Optional modules providing installation benefits: wirelessly interconnected or floating.